On a windy and dank afternoon at Trungle Parc, Mousehole were without several regulars but still swept aside winless Bude Town with an impressive all-round display which could well have resulted in a double-figure scoreline. Steven Ziboth and Gerens James both recorded hat-tricks and centre-back Adel Fafaiti grabbed his first goal for the club. The win takes The Seagulls up to 6th place in the League table, with games in hand over all but one of the teams above, ahead of an interesting League Cup second round tie away at Premier Division bottom side Sticker on Friday evening (7:45pm) – (this game brought forward from Saturday). With the wind at their backs, Mousehole signalled their intentions as early as the 9th minute when Steven Ziboth’s penetrating pass created space on the left for young left-back Tom Hands, whose instant whipped-in cross was marginally ahead of Gerens James’ arrival at the far post. After gradually coming to terms with the high wind, The Seagulls finally took the lead on the half-hour when good work just outside the box by newcomer Herman Niamke enabled Steven Ziboth to fire in a low left-footed drive from the 18-yard line. And just three minutes later the wingman played a smart one-two with Gerens James before placing a 15-yarder low inside the near post this time with his right foot. Bude were donated an unexpected gift on 37 minutes when indecisiveness in the home defence in dealing with a through-ball left Ruan Tape to side-foot into an unattended net from 25 yards out. Mousehole created chances before half-time in an attempt to give the score line some credibility, centre-back Adel Gafaiti heading inches over from a corner on 41, and Ziboth close to a ‘true’ hat-trick with another shot from the edge of the box just too high. In the second half, the home side’s pressing and measured passing brought the constant threat of a goal, with three of them arriving in a seven minute spell. On 53 minutes, Adel Gafaiti nodded in his first goal for the club from a few yards out after Gerens James’ header from a Ziboth cross had rebounded off the bar. In the 56th minute, Gerens James scored the best goal of the game to make it 4-1, Paulo Sousa cleverly releasing the energetic Hermann Niamke inside the box on the right for a perfectly weighted cross along the 6-yard line tapped home in ‘classic’ goal-poaching fashion at the far post. Steven Ziboth duly got his hat-trick on the hour, swerving past his marker to power a drive into the roof of the net from an angle, after the visitors’ defensive cover had been turned inside-out by a neat passing move across the area. Not to be out-done, Gerens James had a goalbound header from Billy Curtis’ cross blocked on the line by a well-positioned defender on 69 minutes, but two minutes later in a repeat of that move James’ close-range header made it 6-1, and shortly afterwards a spectacular hat-trick goal from a diving header into the net was ruled out for offside. Undeterred, the prolific marksman had to wait just five minutes more as Ziboth yet again prised open the defence, Paul Sousa unselfishly squared the ball inside and James calmly side-footed in from 8 yards. 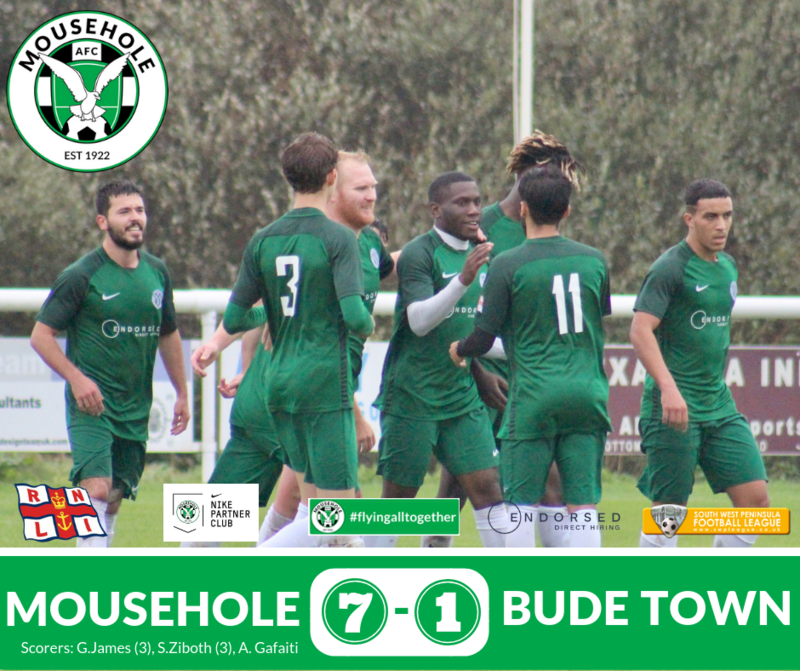 To their great credit Bude had played throughout with a sportsmanlike attitude despite being constantly put under pressure, and at 7-1 down they abandoned their damage-limitation tactics to venture forward in numbers in a spirited and entertaining last ten minutes. Harry Hopcroft sent a thunderous 30-yard drive against the crossbar and then forced debutant goalkeeper Jason Robertson – who had been Porthleven’s ‘man of the match’ in their narrow 3-2 win over Mousehole in September – into a sharp diving save. 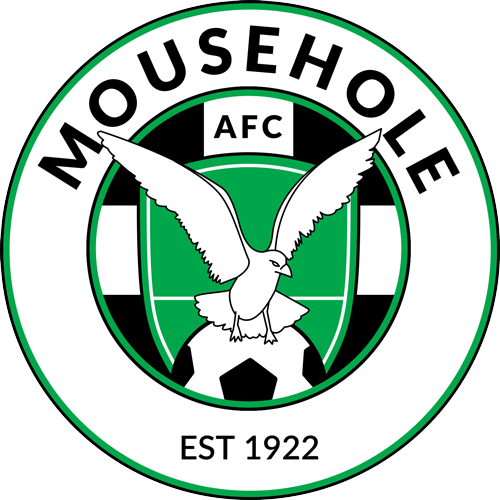 Mousehole: Jason Robertson, Matthew Howes, Billy Curtis (captain), Adel Gafaiti, Tom Hands, Lorenzo Qerimi, Hamza Kaid, Paul Sousa, Gerens James, Steven Ziboth, Hermann Niamke. Substitutes: Ryan Andrew (for Hamza Kaid, 65), Jason Simmonds (for Steven Ziboth, 87), Tom Patrick, Dom Angove, Sam Shulberg. Scorers: STEVEN ZIBOTH 30 (1-0), STEVEN ZIBOTH 33 (2-0), Ruan Tape 37 (2-1). Half-time 2-1. ADEL GAFAITI 53 (3-1), GERENS JAMES 56 (4-1), STEVEN ZIBOTH 60 (5-1), GERENS JAMES 71 (6-1), GERENS JAMES 76 (7-1). Full-time 7-1. ALL THE MOUSEHOLE GOALS HERE…..